Enasidenib (AG-221) is an oral inhibitor of mIDH2 proteins. In the phase 1/2 AG221-C-001 trial, enasidenib was associated with an overall response rate (ORR) of 40.3% and median overall survival (OS) of 9.3 months in patients (pts) with relapsed/refractory mIDH2-AML (Stein, Blood, 2017). Older pts with untreated AML who are not candidates for standard induction chemotherapy due to advanced age, poor performance status, comorbidities, poor-risk cytogenetics, or other factors, pose a therapeutic challenge. Determine clinical outcomes for older pts with previously untreated mIDH2 AML receiving enasidenib monotherapy in the AG221-C-001 study (NCT01915498). Pts aged ≥60 years with previously untreated AML who were not candidates for standard treatment (Tx), with ECOG performance status scores of 0-2 were eligible. Pts in the phase 1 dose-escalation received enasidenib doses of 50-650 mg/day, and all pts in the phase 1 expansion and phase 2 received enasidenib 100 mg/day, in continuous 28-day Tx cycles. 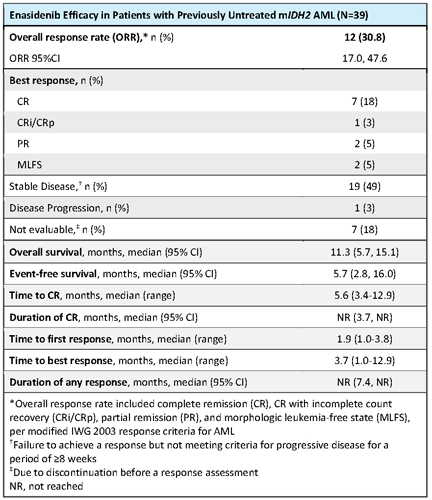 Response was assessed per modified IWG response criteria for AML. Safety was assessed by Tx-emergent adverse event (TEAE) reporting. Of all 345 study pts, 39 (11%) had previously untreated mIDH2 AML. At data cutoff (1 Sep 2017), 3 pts in complete remission (CR) continued to receive study drug, 2 pts in cycle 27 and 1 in cycle 35. At entry, median age was 77 years (range 58-87), 26% of pts had NCCN poor-risk cytogenetics, and 22 pts (56%) had an antecedent hematological disorder (AHD), including 17 with prior diagnosis of MDS. Median time from diagnosis was 1.0 month (range 0.1-4.7). Median number of enasidenib Tx cycles was 6.0 (range 1-35). Seven pts (18%) attained CR; estimated median durations of CR and of any response were not reached (NR) (Table). ORR was 30.8% (95%CI 17.0, 47.6). Times to first and best responses were 1.9 and 3.7 months, respectively. Three pts proceeded to transplant and were alive at data cutoff. At median follow-up of 8.4 months, median OS was 11.3 months (95%CI 5.7, 15.1) and event-free survival was 5.7 months (2.8, 16.0). Median OS in responding patients (n=12) was NR (95%CI 10.4, NR). The most frequent TEAEs (any grade or cause) were fatigue (44%), decreased appetite (41%), and nausea and constipation (38% each). The most frequent Tx-related TEAEs were hyperbilirubinemia (31%) and nausea (23%). The only serious Tx-related TEAEs reported for >1 pt were IDH differentiation syndrome (n=5, 13%) and tumor lysis syndrome (n=2, 5%). Tx-related TEAEs led to dose modifications for 3 pts (8%), dose interruptions for 9 pts (23%), and Tx discontinuation for 2 pts (5%). Enasidenib induced hematologic responses in approximately one-third of these older pts with previously untreated mIDH2 AML who were not candidates for standard Tx, and more than one-half of whom had an AHD. Approximately 1 in 5 of these pts attained CR during enasidenib monotherapy. Responses were durable: median duration of any response was not reached. Median OS was also promising (11.3 months) in this cohort with median age 77 years; pts aged >65 have an estimated median OS of only ~5 months, even when treated (Medeiros, Ann Hematol, 2015). Tx-related TEAEs were infrequent and led to discontinuation for only 2 pts. These results suggest enasidenib may benefit older adults with mIDH2 AML who are not fit to receive cytotoxic regimens. Enasidenib is under study in a similar AML patient population in the Beat AML Master Trial (NCT03013998).